You've been feeding your ears rubbish for years and they just won't take it any more. Please, for the love of your precious lug-holes won't you give them some high-quality music? Astell&Kern is certainly hoping that you're tired of MP3s to the extent that you'll splash out £400 for its new high-resolution audio player. The AK JR is junior in name only, the publicity material is keen to point out, this is a player that punches well above its weight. For one thing, it's made from gorgeous metal with delightful physical controls on its exterior surface, while maintaining a modern touchscreen as well. More important than the style though is the support for 24-bit music at 192KHz which puts this way about the abilities of CDs, and will need a high resolution collection to really make it sing. It also has a Wolfson DAC, which translates those digital bits into harmonious music. These DACs are considered the dog's proverbials, and they feature in a lot of good quality audio equipment. Interestingly, Astell&Kern mentions Bluetooth streaming support too, though why you'd go to this expense to use Bluetooth we have no idea. It's also got a headphone amp built-in, which 1.95V RMS power, sufficient to drive even high-end headphones, says the company. Internally it has 64GB for music storage, but it also has microSD support for cards of up to 128GB too, so storage shouldn't be much of an issue, even if you are storing lossless and high-resolution audio tracks. The AK JR will appear in shops at the end of May after it's first shown off at the Munich High End show on the 14th. 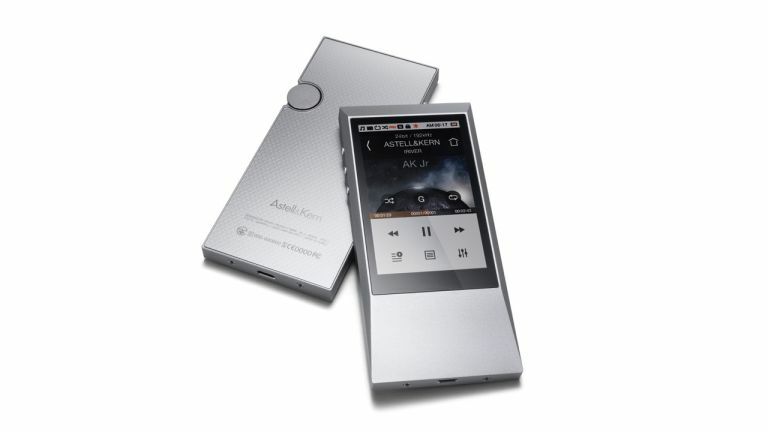 It has a suggested price of £399, which is significantly cheaper than the last Astell&Kern player we reviewed.